San Diego, CA – In recognition of inspirational teaching nationwide, 51 teachers around the country – representing each state and the District of Columbia – have been named recipients of the first-ever National University System-Sanford Teacher Award. 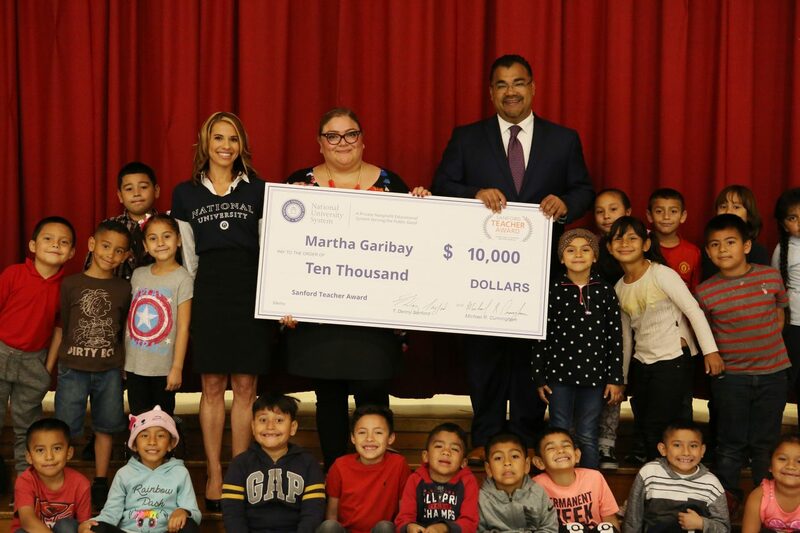 The teachers each receive $10,000 for demonstrating their commitment to creating inspirational and harmonious classrooms that support student development and achievement. The award is in the name of philanthropist T. Denny Sanford, who is committed to supporting inspiring teaching nationwide through PreK-12 programs that are being expanded nationally by the National University System. Each of today’s teacher recipients qualify for a chance to be recognized as the national winner of the Sanford Teacher Award, which will be named in early 2019. The teachers being named today were selected by a committee of educators through an application process that included nominations and information provided by each teacher to assess how closely they represent characteristics of inspiring teaching, which included: Enthusiasm for teaching; empathy and warmth towards all students; fostering positive relationships with all students; creating a positive learning environment; and recognizing student strengths. Recognizing PreK-12 educators who clearly emulate these qualities allows for further exploration and research into inspirational teaching approaches that can be applied to the wider educational community, as noted in a preliminary report released today. The qualities identified by the Sanford Teacher Award reflect the mission of education-focused programs that are being expanded nationally through the leadership of the private, nonprofit National University System, which is home to one of the Top Ten largest schools of education in the country. The Sanford Programs, which were developed through the support of Mr. Sanford, include Sanford Harmony, a PreK-6 social emotional learning program that helps children develop communication and collaboration skills, and the PreK-12 Sanford Inspire program that offers teachers research-based resources and lessons to create inspiring classroom experiences. The Sanford Teacher Award is part of the national expansion efforts of the National University System-based Sanford Programs, which in addition to Sanford Harmony and Sanford Inspire also includes a national network of fundraiser training programs anchored by the Sanford Institute of Philanthropy at National University. Mr. Sanford has donated about $130 million toward the National University System in support of the programs’ national expansion, an effort that involves the collaboration of universities around the country that share a similar focus and dedication to the professional support of educators and the nonprofit sector. To date, more than 3 million people have been impacted by the three programs. The teachers being honored today are in addition to five Inaugural Sanford Teacher Award recipients who were identified earlier on in the campaign for representing key qualities being celebrated by the Sanford Teacher Award, and who were involved in raising awareness of the campaign. Both the Inaugural recipients and the teachers announced today qualify for the national title, which adds up to a total award of $50,000 for one of the teachers. View list of Sanford Teacher Award recipients.